Having traveled in many European countries, traffic control lights in there usually flash green for a few seconds to announce that the light is about to change to red. Austin, TX is notorious for red light runners, and it would seem to be painfully obvious to our State of TX equipment and traffic control gurus that the more lead time a driver has to anticipate the need to slow and/or stop, the better, and the obvious benefit would be a decrease in collisions. Even Mexico has this method. Why don't we in the USA have this as a design standard? Because upon seeing an impending change to red, many people don't slow down, they speed up and often misjudge they're timing. no matter the duration of the yellow or blinking green light, this will not change -- people are impatient. Here in Montreal, a flashing green light has a very different meaning: it signals that you can safely make a left turn left because traffic in the oncoming lane has a red light. It performs the same function as a green left arrow. We have left arrow signals at some intersections, but most use the flashing green. It's a bad design because its meaning is utterly non-intuitive. Nobody who comes here from elsewhere knows what it means without asking (I've seen explanatory signs at only two or three intersections in the city). The same criticism holds true for the Boston area's approach to warn motorists to stop for pedestrians who want to cross the street: the traffic signal's red and yellow lamps are illuminated simultaneously. The first time I saw one of these I assumed the traffic light was malfunctioning, and I drove on through. There was a cop parked just beyond the light and I received a $70 ticket. Back to the flashing green: Montrealers frequently drive into the States, so a flashing green light with a different meaning than what we're used to could have disastrous consequences. First, don't we use yellow lights to perform the function that you describe above (i.e., to warn drivers that the light is going to change to red)? Second, I may be wrong on this but I seem to remember that in the U.K, at least, the flashing occurs during a red light and is used to advise motorists that the light is about to change to green. UK traffic lights don't flash. They go amber to indicate they will go red soon, or red+amber to indicate green soon. However, the 'green man' light for pedestrians flashes to indicate that the time for crossing is nearly ended. On our news a while back was a clip on a wonderful traffic-walk-design: a "person-walking" light tells the crosser only it's OK to go, and you have the right-away. However, it instantly turns to "don't cross", leaving you stranded. I'm reminded of the scene from Rainman, where Ray correctly stops in the intersection, seeing the sign light up saying "No Crossing"! Further, often times it's hard to tell which light is lit, due to sunlight. The news show demonstrated a traffic signal where both the "walker sign" was lit, and a counter displayed a "countdown", to let you know how many seconds you had before you lost the right-away. If you were about to cross the street and saw the counter at 5 . 4 . 3 you knew not to cross. The absolute worst traffic light signalling I've ever seen is the US/Canadian flashing red signal. Apparently it means you can go (a red signal that means you can go? ); provided you stop first. Doh! Who makes this stuff up? Find them and kill them before they kill anyone else. In most other situations, of course, a flashing red means STOP; for example at railroad crossings. 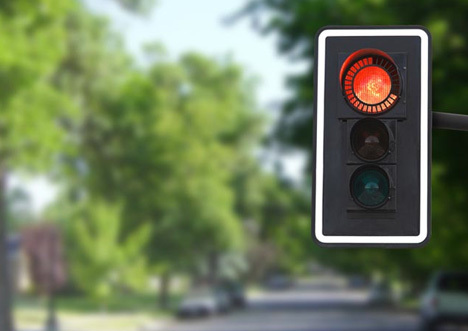 Flashing red light indicates a four way stop- after an electrical outage or emergency, the intersection must be reset. Meanwhile, it's better to have the intersection be a 4 way stop than a free for all. Also, the lights with timers are used extensively in San Francisco (I've heard other cities have installed them). They really are wonderful. Taipei uses a variation on the "person walking" light. An animated stick figure strolls to let you know you can cross the street, but as time runs out the strolling figure first hurries and then runs (as do the pedestrians in the cross walk). Flashing green in Massachusetts means that you can go, but must proceed with caution because the light may change. This is largely used where there are crosswalks on busy streets where there is much more car than pedestrian traffic. When a pedestrian pushes the button to cross the street, the light will change to yellow and then red. But the normal state of the light is flashing green. I think this is not commonly used elsewhere. One problem I can imagine regarding a flashing green light is that there would be a time when none of the lights were lit up. So, essentially, Green means go, yellow means slow, red means stop, and nothing would mean "prepare to slow"? If it is rapidly flashing, that'd lead to anxiety, as in, "better hurry up" opposed to "better start slowing". Pedestrian Crossing: The most intriguing traffic light that I've seen recently in Asia was in Kuala Lumpur, Malaysia in early March. The green light is an a figure of a man. It is animated, so that the green figure is 'walking'. As time gets closer to a change to red, the animation speeds up, so the green figure is almost running. Besides being a fabulous visual experience, I think it delivers accurate instructions to the non-jaywalking road crossers. This doesn't address the original question, but I find it interesting. In San Francisco, where I live, many pedestrian crossings in downtown are being refitted with a new version of the graphical walk/don't walk sign. These new crossing signs display a countdown timer, in seconds, that tells the pedestrian exactly how much time they have left to cross the street. I think it's an elegant and simple solution to the problem of the "flashing red hand" -- you never knew exactly how long you have to cross. In Germany--at least in the southern parts I traveled through in February--the yellow light comes on for the last second or two of the red cycle to indicate an impending green cycle. Both red and yellow go out when the green begins. I assume this is to allow motorists time to shift from neutral to first gear and thereby not waste valuable green time. I used it that way in my rented VW and it worked quite well. Some corners in Washington DC feature the countdown timer with the pedestrian signal. The pedestrian crossing signals with countdown timers that have popped up around DC are helpful to pederstrians and drivers (psychologically). As I recall from a visit to Yangon, Burma, some intersections used neon timers on the traffic light itself. I also find traffic signals that have a bright blinking strobe on yellow to be helpful as well. I agree with earlier comments that a flashing green light is simply a warning that the amber light already serves. Although a similar concept does happen here in Australia (atleast in the state of Victoria) which serves to warn trucks that the light is about to turn red providing them with sufficient distance to slow down and stop. It involves a sign up the road away from the intersection with two flashing amber lights that commence a short time before the lights at the intersection change. When these lights start to flash a motorist hasn't got the time or distance to run the red light because it will be too late by the time they get to the intersection (assuming they're not speeding) but of course they are aware that they will need to stop. Irish pedestrians don't like waiting for pedestrian signals to change. This can lead to some pretty dangerous situations. The local government in Dublin, as well as the airport authority has introduced countdown timers on a number of the more dangerous pedestrian crossings. However, they work in almost exactly the opposite way to the ones described here and which I have seen in Singapore and elsewhere. They count down the number of seconds until the pedestrian signal will go green again (as opposed to telling you how long until it will go red again.) The logic appears to be to encourage pedestrians to wait for the signal change, which may be just a few seconds away, rather than running across the road through oncoming traffic. In my experience, this system seems to work well for us in Ireland. I don't know of any statistics on whether this actually reduces accidents, although it should be possible to find this out. In Ireland, we follow the convention of having either an amber man or a flashing green man for a few seconds before the pedestrian signal changes to red. I don't see any good reason why the countdown should not be used for both phases (green->red and red->green) of the cycle, to give the best of both worlds. Dear, I am inventer of count down traffic signal during 1987 . I apply in USA disclouser 1989 and see also in uk Patent offical web sid . http://webdb4.patent.gov.uk/patents . patent no GB9020337.3 . Due to different problem reson and different laws reason it is importent that we use countdown timer. It is a Pakistani inovation and Law for public safty. Many years ago we had an safety campaign in the UK featuring Amber Gamblers who were people who went through the junction when lights were at Amber. Normally this does not cause a problem if one is proceeding through a single Amber light but if one reacts too quickly when the Red/Amber combination shows then the ad depicted the gamblers meeting in the middle of the road sideswiping each other. The rules on continental Europe differe slightly one country from another. Typically these affect the pedestrians simultaneouly using the lights as a crossing with the vehicles. Never safe to assume anything. Sadly this is another thread where we have a specific cultural usage dressed up as a universal. Regarding why some of these suggestions aren't taken up in the US, it should be noted that since the installation of the redlight violator camera, many municipalities regard the intersection as a source of revenue. Studies have shown that decreasing the time on the yellow light increases the number of violators and therefore revenues, while increasing the time decreases the number of violators. Hence, the impedement to adopting these great ideas is (in some cases) political, not technical, legal, or cultural. One design I didn't note here was (is?) in Pittsburgh PA ca 1970 when I was in college. One extra step - green changed to green+amber to amber to red. It was intuitively obvious and seemed to do a good job of _discouraging_ people from beating the light on amber. I forget if there was a delay between red and cross traffic getting a green, I don't think there was. Clearly, that cross traffic delay is designed as a safety thing, and seems to be used in most places I frequent now. When I moved to Massachusetts I was surprised several times when I started out on green and people were still running the red. Maybe Mass needs an extra state that means "you really ought to stop now!" In Denmark a few traffic signals for pedestrians have been changed to show remaining time to change (countdown). It seems that 87 % thinhs the information is usefull and more people respects the signal than before. People crossing red light have fallen from 16% to 11%. Here in the Netherlands, the cycle is green - amber - red - green. Pedestrian "green man walking" lights (no amber!) do start blinking here, as your time to cross runs out. You'll also hear the audio signal for the blind ("ticker") speeding up. An interesting test project in Odense, Denmark set up "lights-poles" in a bicycle lane every 50 meters with a moving "wave" of "green in the red". This gave a bicyclist the opportinity to adjust speed and "follow the green wave" and avoid stopping at the traffic light. As far as I know the test was successful, but I don't know the status of possible general implementatioon. I would like to know if anyone has pedestrian count down timers on adaptive traffic signals. In New Zealand we run SCATS. This can shorten a phase if there is no demand. But I can't see how we can put in count down timers for our peds. On a (just about) related point of traffic signage, I wanted to share this wonderful site, which compares traffic iconography on roadsigns all over the world. Thailand has experimented with timers above some traffic lights throughout the country. i don't know on what basis they were picked. Bangkok in particular is notorious for its crazy and congested traffic (although nothing in my experience beats La Place de La Concorde at rush hour). I have not seen any formal reports, but the timers seem to have had a good effect even helping to keep motorcyclists at the stop line...unheard of!! In the meantime, lane markings are, for the most part, ignored. Here in Geraldton, Western Australia, a number of traffic lights have a 'Prepare to Stop' sign in red with two amber flashing lights about 100 metres before the lights. These lights start flashing about six seconds before the main traffic light green - amber - red sequence and stop flashing about six seconds before the change from red to green. This is done because these lights are on a road-train route where the trucks can be up to 53.5 metres long (175.5 feet) and weigh up to 175 tonnes. Stopping one of these beasts takes a bit of room and these lights allow the driver to slow down and not necessarily come to a full stop. I agree with both of the above comments 100%. The municipalities see this as revenue and are playing a 'I gotcha game' with the "sheeple". I understand that in some cases, the vendors of the surveillance equipment have an incentive to entrap motorists with variably timed yellow lights. I saw what might have been a 'yellow light countdown trial' somewhere in California. It was great. I knew I would never get caught in the middle of an intersection because of a short yellow. I do not remember where it was. But, I thought it was in the Palm Desert area. I was in Seoul, South Korea, recently, and they use a series of arrows to show how much time is left to cross; the fewer the arrows, the less your time. In the early 70's I traveled out west. Some cities and states used a system where the light was green for the usual time then it went to green & yellow for a few seconds then yellow for a few seconds then red. What a boon to comercial drivers ! As a comercial driver for over 35 years, it saves a bundle on brakes and "stop here on red" lines. It doesn't take a rocket scientist to figure out, black marks at an intersection means the light is wrong. Why don't the college educated transportation people check this stuff out ? It takes more time and space to stop 40 tons of stuff. I feel that this should be a system country wide. How much could it cost to program these lights to improve safety ? I know that some people would speed up at an impending change but what about the normal people who would bebifit from this ? In Thailand the signals include a 3-digit numerical display near each traffic signal. This counts down the number of seconds until the light changes. The numerical display is in red if the light is red and in green if the light is green. Initially you woudl think that cars would speed up when time was low, or that they would gun their engines so that they could jump-start when the light turned green. In fact, the few seconds before the light changes from red to green the cars cannot go so the drivers are busy checkout out the intersection, lookinf for what is going on. It is an excellent way for cars to pay attention and to observe the intersection prior to actually going. Likewise, as the green counts down to zero, cars start to give early indications of whether they plan to go through the intersection or not. All in all, this is clearly a system that works and that helps traffic to move and increases safety. I have traveled in B.C. a lot and have seen an interesting system used that makes sense to me. The Green light will blink at first to catch your attention to go, or when you are in no danger of turning to yellow. The green becomes steady when it is stale, and it make turn yellow soon. Yellow is prepare to stop, and of course, red means stop. They also make use of pre-intersection warning lights that start flashing yellow before a light ahead is about to change or is yellow/red , particularly when a light is around a corner ahead or on rural highways. I like the blinking green because it catches your attention and makes the solid green into a true "stale" green. Subject:- Traffic lights I am aware that in the UK, the GREEN to AMBER to RED sequence has no formal timing period. In London, the amber light will stay on for 4 seconds before going RED. In Oxford, the amber light will stay on for 3 seconds. This difference in timing does catch out a lot of people (especialy if the junction is ON CAMERA.) If the amber timing is only 3 seconds and should the speed be less than 20 MPH, clearing the junction is not possible at lower speeds. I would like to see uniformity throught the country and the timing not less then 4 seconds. I fondly recall the Marshall lights as a child travelling to Melbourne's beaches. The picture shown is of a unit at Melbourne's Musuem, and as I recall there is another non-working set in Melbourne's CBD. Wikipedia states they were placed on Nepean Highway, but in fact they were on Beach Road, Sandringham (Melbourne's history is intimately tied to the UK's) at a roundabout in the centre of the road. I can't recall seeing such "lights" anywhere else in my extensive overseas travels, but I wouldn't be surprised if some exist in New Zealand which in some respects is even more UK-like in its road signage than Australia. But as you say, they couldn't be altered to shift times for changing traffic circumstances, but perhaps nowadays the green red and amber zones could be accounted for by LEDs which could changes colours. As it stands, I use this picture in my treatment of anxiety patients so that they see these lights in their mind's eye as they approach "dangerous" situations (eg boarding an aircraft in the case of fearful fliers) and when in amber they utilise their anxiety-reduction techniques taught in the sessions, usually with a number attached as a further measure. The biofeedback system I use to measure heart rate variability uses red, blue and green signals depending on the level of arousal with green being the aiming point (when heart rate variability is maximally determined by diaphragmatic breathing). A problem with any attempt to standardize traffic lights around the world is that cultural responses to them are very different in different countries. In Switzerland, say, or Japan, pedestrians obey "don't cross" signs even if it's the middle of the night and there is no traffic at all. In France (where I live) pedestrians (and motorcyclists) pay very little attention to such signs, and in other places I've been they ignore them completely. An indication of when the lights are about to change to greeen (red and yellow showing together) worked well when I was a child in the UK, but it works less well now that people are less law-abiding. In many countries the yellow light that precedes the red is taken as an invitation to accelerate to be through before the light changes to red. Someone once commented to me that a red light in southern Italy means that you may stop if you wish, but you should bear in mind that the driver behind you may not wish to stop. The amount of time it takes to go through a complete cycle also affects behaviour. Here in Marseilles the cycle is very slow, which means that if you stop when it changes to red you'll have a long wait before it goes back to green, and four or five drivers may continue to pass on red. On the other hand nobody is in a great hurry to start when it turns to green, both because they know that drivers will continue to cross their path, and because they also know that they'll have plenty of time before it stops being green. I've known the first driver in a queue to do nothing for 5 seconds after the light turns to green, and, unless there are people in the queue from northern France, no one will sound their horns. In contrast, in Santiago (Chile), the cycle used to be (20 years ago) very fast, and the behaviour was exactly the opposite. As soon as the light changed to red everyone would apply their brakes immediately, and if anyone failed to start within a millisecond of having a green light all the horns behind in the queue would sound. Many people would start immediately they saw that the people crossing their paths had a yellow light. (When I was in Vancouver many years ago I saw that all the lights were designed in such a way that it was impossible to see what anyone else's light was doing.) I used to wonder whether the behaviour depended on the cycle time, or vice versa, but I've noticed that in the past 20 years the cycle in Santiago has become much slower than it used to be (though not as slow as it is in Marseilles) and the response to changes in lights has slowed down as well, suggesting that it is the cycle time that determines the behaviour. Nonetheless, it may have nothing to do with traffic lights: a study some years ago showed Santiago as the city where pedestrians walk fastest in the city centre, and although Marseilles was not included I suspect it would have been one of the large cities in the west where they walk slowest. In Peoria Arizona we have traffic lights that go from green to red with no yellow light. I would like to see a community paint lines on the road similar to the stop line at intersections. These lines would mark the point at which you can safely travel through the intersection if the light turns yellow (if you're traveling the speed limit). For example, at 30 miles per hour you're traveling 1/2 mile per minute or about 44 feet per second. If a yellow light lasts 1 second then the line I'm talking about would be painted 44 feet from the intersection. If you're between this line and the light when it turns yellow you can rest assured you'll make it to the intersection before it turns red. If you're outside of that range then you need to stop as you can't make it through the intersection before it turns red. Note, from what I understand of the US traffic law, you can legally enter an intersection when the light is yellow, even if it changes to red before you exit the intersection you're still OK. It's entering the intersection when the light is red that's illegal. Damjan Stanković is proposing this concept to signal impending change. Oops. There may have been some advantages to old fashioned lights. offer a much longer service life and are more durable than their incandescent counterparts. Response to Ron Mason, March 16, 2007-Yes the volume/capacity of traffic in London area is greater than Oxford hence they give more amber time to ensure the traffic flow is within descent level of service. The additional 1 second to the London area makes a great diffrence both for the clearance interval for amber time gamblers and length of queueing at the signalized intersections. The annual average daily traffic of the typical London roads are significantly greater than the roads in Oxford. Seems to me that "positive reinforcement" is under applied. My understandinging in Western Australia is that red means "do not proceed "and amber means "stop" Ask most people and they will tell you that red means "stop". Signage to ten percent of lights to reinforce the message along side each light would reinforce the message and save many lives by encouraging anticipation of the amber light and not the red light . Seems so simple. The flashing amber lights approx 50 metres before a controlled intersection works quite well by being a "reinforcement" so why not at some intersections that continue to keep the message that "amber means "stop". Otherwise what is the point of the amber light . I somehow doubt the effectiveness of the "positive reinforcement", as most folks are 100% aware of what the lights mean (regardless of semantics), and are rather intentionally gaming the lights in order to advance their vehicle. Foolish, yes, but I do not believe defining the light as one thing or the other will change that behavior. Several times I've seen the meaning of an amber light described as "stop if it is safe to do so". Incorrect. It means stop. In the UK, Amber means stop. Get some driving lessons, you Brits who think otherwise. Here in the Province of Ontario, Canada, our Highway Traffic Act says: "Every driver approaching a traffic control signal showing a circular amber indication and facing the indication shall stop his or her vehicle if he or she can do so safely, otherwise he or she may proceed with caution." (Section 144(15), current to Dec 1, 2010) My experience on the Ontario roads is that, as others have reported, individual drivers interpret this requirement very differently. The Ontario version is certainly textually different than the UK code, but I'm not sure it has a different practical result. The wording of the UK code puzzles me - surely "after you have crossed the stop line" you have ALREADY "gone on", so telling you that you may go on if the light appears at that point seems odd. In Australia, if a signal changes to amber you must do one of two things. If you are at a distance where stopping is deemed hazardous or potentially dangerous, you must proceed through the intersection on the amber light. But, if you are at a safe stopping distance and the light has changed to amber, you must stop.